Patti Heldman and her mother. “I watched my parents take responsibility for their elders with such respect,” says Patti. Each installment in this series features a different perspective on Cincinnati 2020, the Jewish community’s collaboration to build an engaged and empowered Jewish community by the year 2020. This week, we hear from Patti Heldman, Vice Chair-Elect of The Jewish Home of Cincinnati Board of Trustees. What is your current title, in regards to older adults and in terms of your involvement with Cincinnati 2020? I am Vice Chair-Elect of The Jewish Home of Cincinnati (JHC) Board of Trustees. I will begin a two-year term as chair beginning late spring 2019. I was invited to join the Cedar Village board six years ago, one year after my mom moved to Cedar Village from Indianapolis. She remains a current resident. The JHC was formed in 1990 as a nonprofit organization and has been doing business as Cedar Village Retirement Community (Cedar Village) since 1997 when that facility opened in Mason. Even after the sale of Cedar Village, JHC continues to operate with the same board. The board is passionate and entrepreneurial about the Jewish programs and services provided to residents. Our board members work quite well together and we have a collaborative relationship. We’re currently working with the new owners to ensure that the Jewish mission-related commitments continue at Cedar Village, such as Jewish cultural programming, pastoral care, and the availability of freshly prepared kosher meals. How did you first hear about Cincinnati 2020? What is your role now? Initially, I attended the Federation’s 2020 launch as an American Jewish Committee board rep. I remember that the brainstorming session concluded with a gargantuan list of suggestions for 2020 and that our community’s aging population was identified as a priority. The challenges of maintaining a nonprofit, self-sustaining nursing facility such as Cedar Village are similar across the country. To get ahead of the problem, the board of the Jewish Home started its strategic planning process two and a half years ago. That evolved into the Aging 2.0 Task Force that includes the Jewish Home board. I am a strategic planning member representing the JHC, helping to build a roadmap for our aging seniors, along with professionals and volunteer leaders from The Jewish Foundation, the Jewish Federation, Jewish Family Service, JVS Career Services, and the Mayerson JCC. The Aging 2.0 Task Force is new this year and came as a result of the sale of Cedar Village. How do you see it pushing forward the Cincinnati 2020 goals? The fact that Cedar Village has faced challenging times over the past several years was the catalyst to convene an Aging 2.0 Task Force and prioritize aging services. Cedar Village forced our community to take a deep dive and review our past and current services for aging seniors. The Aging 2.0 Task Force, facilitated by Arlene Herman, has identified three major impact areas: Housing Options/Aging in Place, Jewish Connections and Observances, and Adult Day/Respite Care. Each of the members has a vast array of experience, talent, wisdom, and enthusiasm and carry the same passion as I do across the spectrum from baby boomers to supercentenarians. Why should our community focus on aging? The youngest of the baby boomers will be reaching 65 years old by 2029, while the oldest are now 72 years old. Research indicates that care needs escalate as we age. Very soon, this will be 20 percent of our population, and our community needs to be prepared. 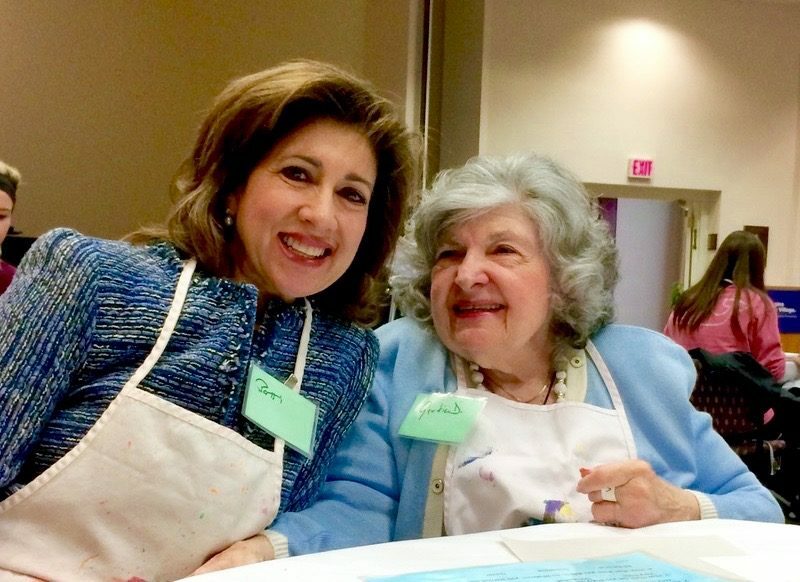 Honoring, respecting, and showing reverence to our aging seniors is part of the fabric of our Jewish culture. We have been the stewards for our aging parents, grandparents, and elder community members for centuries. The Fifth Commandment states, “Honor thy father and thy mother.” One way our community has served generations of Jewish seniors has been by providing a nonprofit Jewish nursing facility for more than 120 years. My parents have been positive role models for me by their display of honor, reverence, and great care given to my grandparents, great aunt and uncle, and my father’s much older siblings. They taught me the importance of showing compassion for aging seniors. I watched my parents take responsibility for their elders with such respect. What does Jewish Cincinnati look like for older adults through the lens of Cincinnati 2020? Through Cincinnati 2020 and the Aging 2.0 Task Force, our community leaders have challenged us to make Cincinnati the premier city for Jewish older adults to live. It keeps us on task. We live in a very resilient, entrepreneurial community and have the fortitude and wisdom to generate new ideas for our aging community. I’m very passionate about the aging sector and am inspired at each meeting by those on the team. I’m very optimistic about the future of older adults in Jewish Cincinnati. We are very blessed to have such vibrant, compassionate, caring individuals that serve our Jewish community. Has Cincinnati 2020 been successful so far? How do you measure its successes, when it comes to Aging 2.0 or the Jewish Home of Cincinnati? Cincinnati 2020 has been greatly successful with Create Your Jewish Legacy because of great focus and good leadership among all of our agencies. We have hundreds of multi-generational participants that should be so proud of themselves for helping to create a legacy for future generations. Our community understands the importance of preserving our Jewish history, our Jewish culture, observance and connection to each other, and the importance of enhancing this inheritance for future generations. As we consider the past, we need to adapt and think outside of the box and develop new strategies for living better and aging into the future. What we develop in Aging 2.0 for our Jewish community will extend far beyond our lifetime into future generations, and that will be the true measure of success. Stay connected to Jewish community news and the lives you change: sign up for our newsletter here.